A good APA, the hop presence resembles an IPA and adds some nice citrus, grapefruit, and pine flavors. The malt is picked up in the nose but is less dominant in the taste, although it gives it a bready quality. The mouthfeel is spot on with the thickness and carbonation but is somewhat oily. Overall, the beer is very drinkable, going down easy and with enough hop flavor to make the beer enjoyable for an IPA fan, but it doesn't have a ton of complexity. Still, it's worth trying. If the "session IPA" is to replace the classic American pale ale in the future- Lagunitas is ahead of the curve with this dog of a low-bodied hop-bomb! Its innocent enough austere is light gold, nearly emulating pilsner with a caramelized gaze. But with the taste looming, the nose is taken back by the IPA-like scent that squarely focuses on white grapefruit rind, under-ripened orange and a strong grassy and leafy quality. Its grain and caramel sweetness is supportive of the hop onslaught at first but that is all short lived. The malt sweetness drops out of the middle palate, and leaves creamy malt textures to fend for their own- quickly dominated by the citrus, leaf and herbaceous hop flavor. Strong carbonation brings the vegetative flavors to life and gives the palate a good scrubbing heading into finish. Closing with strong bitterness that stands tall in the absence of malt- dragging with it the character of citrus pith, grass, stem and leaf. Its chlorophyll bite hangs in the back of the throat and is slow to relinquish its grip. The rest of the flavors are fast-fleeting and leaves the palate clean, crisp and refreshed. Man I remember the old recipe for this stuff when it was just eh, not so good. This version, very nice. A blend of that copper and orange color, brings the standard 3/4" white head. Aroma smacks nicely of amarillo hops I believe. Taste is just solid pale ale all the way. Extremely hoppy with a super mild and dry toasted pale malt base. Very citrus like. I could crush so many of these in a single setting. Its summertime in a bottle. When you don't need juicy ipas, when you don't need session ipas, you just need a real serviceable pale ale. Where this can still be elite 1st tier pale ale is it is the other end of the spectrum from say SNPA. There isn't a real caramel malt impression and sweetness here, this is dry hop vehicle. The beer pours out an extremely clear light golden. Almost looks like a The head is really huge on this one and very slowly dissipates. The aroma has big fresh orange, lemon, citrus hoppiness, tons of floral notes.. A clean aroma of Lagunitas yeast. Flavor wise. Upfront, you just get grapefruit and lemon and floral. It has this cracker malt at the middle that is enjoyable and sweet. Then the grapefruit lingers for quite a while. Aftertaste has this weird graininess. Despite this, the body is really light at 6.2% ABV. One could very easily slug these down quickly. A decent pale ale. Would like more hoppiness and less grainy flavors. 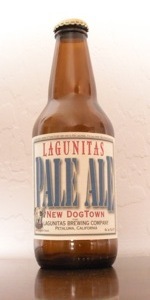 Lagunitas is one of the breweries I found early in my craft beer days, and really helped me get into hoppy beers. But never went back and actually reviewed a lot of the beers, so trying to do that now. Bottling code, but no discernible date. Pours a light fizzy head, little creamy, hits 1/2 a finger before fading back, nice lacing, nice crystal clear golden honey colored. Nose nice hops, a mild citrus and rind, fruity and floral hop presence, a little grassiness to the floral hop, faint grainy malt base, fair fruity hop. Taste brings nice light hop profile, quite floral and a bit grassy, with a nice fruity hop character too, hard to pinpoint the fruit but a fruity like profile, and some fair bitterness that increases a bit as it gets a little spicy like on the back end. Light soft malt base, almost crisp lager like finish, with a big bitter back end, mildly spicy hops, but mostly grassy floral and fruity. Mouth is med bod, a bit soft, decent carb. Overall pretty nice, soft malt base that almost gives a lager like quality, nice hop profile not too heavy in any direction, pretty enjoyable yet very drinkable and sessionable, and a nice hoppy bitter finish. L: Clear golden orange with a massive foamy white head. Excellent retention, sheets of lacing. S: Orange and grapefruit zest, citrus oils just ripping into your nostrils, like freshly shredded orange peels. Intensely zesty and zippy. Smells dank and grassy...not unlike marijuana, as well. A bit of biscuity malt backbone and typical Lagunitas chemical/rubber, but mostly huge ripping citrus and weed. T: Follows the nose exactly. Enormous fresh oranges and grapefruit. The sharpest and most acidic aspects of the fruits. Like all the oils of the skin condensed into a juice. Extremely zesty, sharp, orange and grapefruit. Some sweetness, like the juice of a ripe pink grapefruit. A bit of biscuit malt backbone, earthy, with characteristic rubber/dankness, and a nice weed-like presence. Super citrusy, though. Crisp and dry on the backend, with a bit of lingering citrus peel bitterness. F: Medium-light bodied, light enough to be refreshing and crushable, but heavy enough to please the palate. Moderate to medium-high carbonation, smooth and boisterous on the tongue. Finishes crisp and dry. O: An incredible pale ale. This bottle is super fresh and it's delicious. It's super hoppy but hits the marks in every conceivable way. Simply a pleasure to drink. Amazing! A very good pale ale. Smooth, floral on the front, pine bite on the back. Solid pale ale that I would revisit, but this is on the lower end of Lagunitas IPA offerings. Appearance - Pours a clear copper with a thin white head. The head is recedes fairly quickly and there is one nice band of lacing. Smell - Mild citrus and sweet malt. Taste - Citrus, bready malt, bitter finish builds some. Overall rather muted flavor. Mouthfeel - Light to medium-bodied, dry finish. Seemed thin overall. Drinkability - Easy to drink. Color is amber with a moderate head that is quite persistent. Lots of lacing on the glass too. I have to give it an extra half point for appearance since I LOLed at the label. Citrus hop scents are nice but a bit faded and weak. Hops are a bit subdued in the flavor as well. There is a floral bitterness that provides a slight balance to the malts. Typical mouthfeel. Not bad overall. Draft at Keg N Kitchen in Westmont, NJ. Pours a clear golden orange color with tangerine hues and a one finger frothy white head that slowly settles into a lasting ring. Good retention with streaks of soapy lacing left behind. Earthy hop aroma with notes of citrus and tropical fruit. Slightly resinous with some grass/pine and a pale malt backbone. Nose dominated by hints of orange peel, grapefruit and mango. Medium bodied but fuller than expected with a great balance of dry bitterness, citrus/tropical fruit and pale malt. Dry and bitter up front with some grassy pine flavor countered by orange rind, grapefruit and mango. Subtle malt backbone but just enough to balance things out. Easy drinking and very flavorful. More like an ipa than a pale ale.